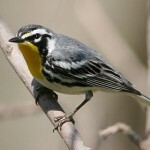 Description: Blackish crown; blackish ear patch bordered in yellow; greenish-olive above, streaked with black; yellow breast with black streaking; white belly; streaked sides. Male’s throat and upper breast are black; and two broad white wing bars. 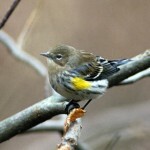 Female has yellow throat and two thin white wing bars. 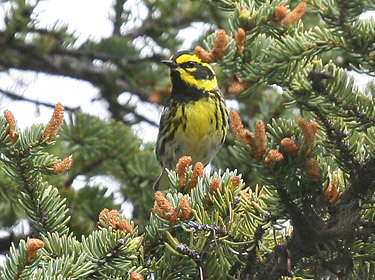 Habitat: Migrants found in low oak, juniper, or pine woodlands. Breeds in tall coniferous forests. 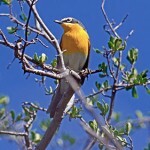 Where in Nebraska: Rare spring and fall vagrant. Seen in at least seven counties in the 1970’s. Field Notes: Occasionally hybridizes with Hermit Warblers.